on a rain soaked runway moments after a thunderstorm has cleared the runway. in this dramatic study by Michael. 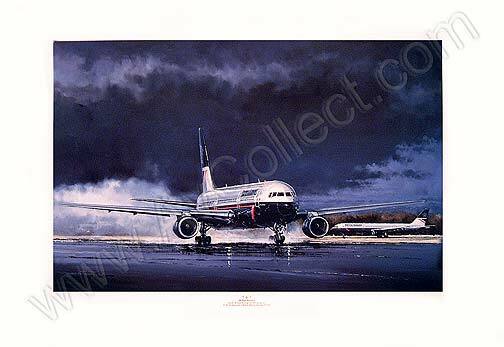 British Airways 767 Pilots are also qualified to fly the Boeing 757, which is featured in the background of this superb print. They frequently fly a 757 for the first part of the day, and then a 767 for the remainder, or vice versa. In British Airways service, the Boeing 767 is a remarkably versatile aircraft, used on both 'shorthaul' and 'longhaul' routes. West from London Heathrow to Vancouver, on the far West coast of Canada, or East of the City of Madras in India, the 767 effortlessly swallows the miles. Both the 757 and the 767 can perform fully automatic landings in the exterme weather conditions of fog and low cloud, and are cleared to operate dowm to the almost incredible visibility of just 75 metres, when most other aircraft would be grounded. Extended Time Operations, or 'ETOPS' for short, is another familiar operation for both the 757 and 767. The 767 was one of the first twin-engine passenger aircraft allowed to operate on the demanding North Atlantic routes, and has built a strong reputation for being reliable and dependable aircraft. Taken from a single limited edition of 750 with 75 artist's proofs, numbered and stamped with the Collectair seal and individually signed by Michael Rondot. A numbered and signed certificate is issued with every print to guarantee the total edition size and authenticity.